Rise and shine with these special-occasion pancakes from chef Mindy Segal of Mindys HotChocolate Restaurant and Dessert Bar in Chicago. Ricotta makes them moist and rich, while lemon curd gives sweet-tart punch. For blueberry compote: In a medium saucepan, combine the 1/2 cup granulated sugar and the cornstarch. Add blueberries, the water, 2 tablespoons of lemon curd, the orange juice and a pinch of salt. Bring mixture to boiling, stirring constantly; reduce heat. Simmer, uncovered, over medium to medium-low heat until the blueberries are tender but not broken down and the mixture is slightly thickened, stirring occasionally. Remove saucepan from the heat; stir in butter and vanilla. Set aside to cool slightly. For pancakes: In a medium mixing bowl, combine flour, 2 tablespoons granulated sugar, the baking powder, 1/2 teaspoon salt and the lemon peel. In a large mixing bowl, combine egg yolks and ricotta cheese. Fold in flour mixture alternately with the milk. Set aside. In a small mixing bowl, beat the egg whites on medium-high speed with an electric mixer until stiff peaks form (tips stand straight). Gently fold egg whites into the cheese mixture. Pour about 1/4 cup batter onto a hot, lightly greased griddle or heavy skillet. Spread batter, if necessary. Cook over medium heat for 2 minutes on each side or until pancakes are golden brown. Flip when surfaces are bubbly and edges are slightly dry. 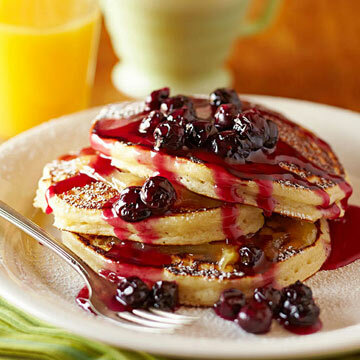 To serve, stack three warm pancakes on each plate, spreading about a tablespoon of the remaining lemon curd between each pancake. Sprinkle with powdered sugar and spoon some of the blueberry compote over the pancake stack.